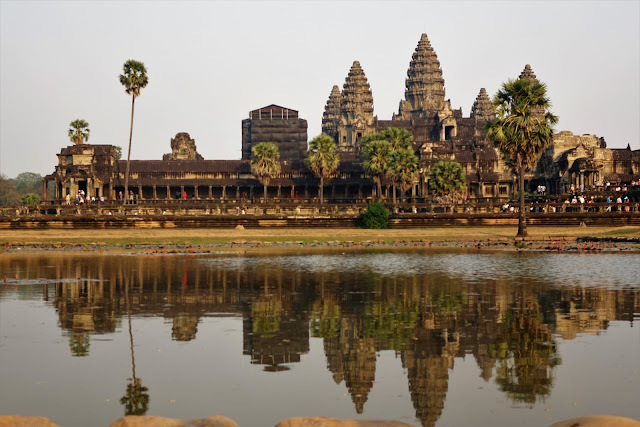 The pictures of Angkor Wat’s stunning architecture and landscape of spectacular beauty inspired me to travel to Cambodia. I never saw a picture of Angkor Wat with people in it, except for captures of Buddhist monks in orange robes reflected in the water as a backdrop to a tranquil landscape. Imagine my surprise upon seeing the long lines at the ticket office. (Passes to the park can only be purchased from the ticket office, a separate building about 10 minutes-drive to the archeological site park entrance. They take your picture and imprint it on the pass). Or I should not have been surprised. As the 8th wonder of the world, thousands of tourists shared the same goal of visiting Angkor Wat and checking it off their bucket list. Also on the night we arrived in Siem Reap, the current city near the Archeological Site, our guide mentioned that visitors outnumbered the residents in Siem Reap. I’d like to think of myself as a traveler rather than a tourist, so I had not done any research before my visit. I’m sure enough has been written about the history and architecture of the many temples in the large area of Ankor Wat. Briefly, Cambodia was once the center of a great empire, stretching into Vietnam, Laos and Thailand. Angkor Thom, was their great capital, with a population of over a million in the 15th century and home to some of the greatest works of architecture in the world. We visited the three greatest architecture: Bayon, Ta Phom, and the most spectacular Angkor Wat. Angkor Thom was surrounded by a huge imposing wall that stretched for miles. It was a city within a city. We entered through one of the most popular gates (I guessed) because it was packed with tourists. Rows of larger-than-life statues of good characters lined the left side and evil or bad characters on the right side of the bridge leading to the gate. It was impossible to take pictures of the gate without the people and cars entering Angkor Thom. So, I focused in on the beautiful landscape, and almost got in trouble for stepping outside the walkway, in between two statues to take pictures of the lotus flowers floating in the water that stretched across the moat. We explored Bayon, one of the most famous temples and the biggest in Angkor Thom. It stood in the center of Angkor Thom with 54 towers and 216 faces carved into the walls, supposedly bearing the image of King Jayavarman VII, the man responsible for its construction. Our guide talked in detail about the characters and symbols representative of the history and legend of that time, like the different animals found in the area, intricately carved into the walls before the main entrance. 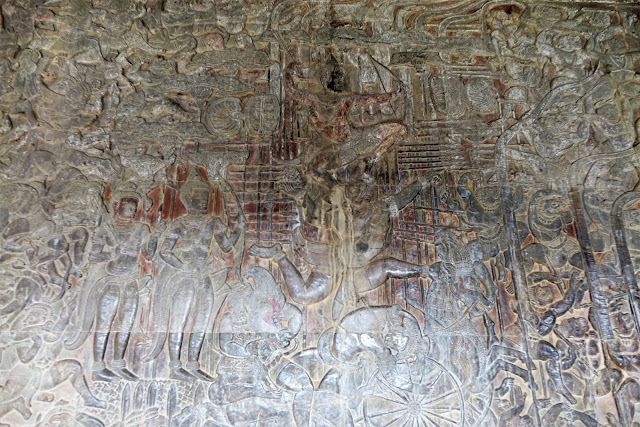 I had not seen so many images of Avalokiteshvara and Asparas carved into the walls in one place. There was even a smiling one (called the Mona Lisa of Asia). We also explored lesser known temples in Angkor Thom like the Terrace of the Leper King, so called because it is covered with moss in the wet season and looks like he has leprosy, and the Terrace of the Elephants. After Angkor Thom, we hiked a few miles to visit Ta Prohm. It seemed that most of the tour guides if not all of them had to mention that Ta Prohm was the setting for the Tomb Raider film to introduce Ta Prohm. But even without the mention of the film or Angelina Jolie, Ta Prohm was impressive. It was where National Geographic’s most iconic picture of Angkor Temple was photographed: the picture of ancient tree growing above the temple and its roots strangling the stone work. The whole setting looked surreal, as if the temples were in epic battle with nature. It’s said that it was left as it was founded by French explorers in the early 19th century. There was a constant flow of people walking the boarded pathway that it was hard to take the iconic photos that graced many travel magazines without the people. I just kept snapping my camera and probably took hundreds of photos. The last temple was the most spectacular of course. 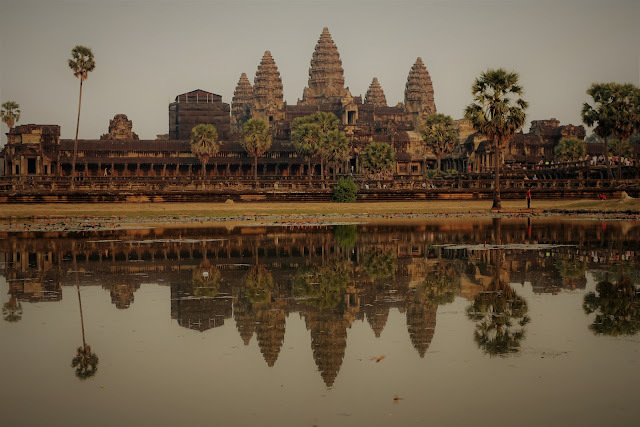 I normally like to explore a place on my own, but as a photo enthusiast I realized the importance of a good guide when visiting a place I psyched myself up to visit, like Angkor Wat or any of the eight wonders of the world. Angkor Wat was huge, the largest religious site I had visited. I would have preferred to go at sunrise and take the same iconic photo I saw from travel magazines. But our guide said I would have been one of the hundreds of tourists who shared the same idea of visiting Angkor Wat at sunrise...and left it at that. (Angkor Wat is unique as few Buddhist temples that does not face east). Our guide suggested that we go three hours before sunset, enough time to explore the temples inside and time for photographing the place at sunset. We walked the wide bridge to the main gate that stretched across the moat. By the time we reached the main gate, I had gotten used to the crowd that I gave up on taking pictures of the main entrance without the people. We entered a different doorway to avoid the crowd. Past the gate, we walked with the crowd to reach the main temple, our guide narrating about the architecture and different structures like the library on each side. We then followed our guide and went to the library instead of going straight to the temple. From there, our guide showed us where to take the best picture, and said that we should see the five towers reflected in the water. There was a wonderful sense of magic as the whole temple was silhouetted in the water. Looking directly to the temple, the whole structure seemed dark then it slowly shifted to dark gray, then lighter gray and it was not even sunset. After a hundred pictures of the silhouetted temple, we moved on to explore the temple inside. Our guide explained the inner walls outer gallery. The bas-relief friezes depicting scenes from the Hindu epics Ramayana were simply amazing. We took our time admiring and taking pictures of the intricate carvings and devatas adorning the walls. We rushed through the crowd and waited in line to climb and explore the 5th floor before closing time, just to get the rope barrier and "CLOSED" sign shut in front of us. Our guide protested and had a long conversation with the guards, but by then the sun was already starting to set, so we rushed back to the first floor and back to the pond to take more reflection pictures. The sunset refracted light changed the color of the temple and its silhouette. I had never experienced anything quite magical and beautiful. The whole architecture had a mysterious property that I could not help but ask the question in awe, “Who built this place?” I know the architect of the sunrise and sunset. The last day in Siem Reap was spent visiting the local market and the Angkor National Museum. At the museum, I heard a co-traveler say, “I wished we came here first before Angkor Wat”. And it was the opposite for me. I was glad we visited the actual site before going to the museum since I would not have gotten that unexplainable feeling while watching the event unfold. Angkor Wat Main Entrance with statue of Naga on the door steps.